This short but sustained climb is climbed as an alternate start to Eagle Buttress or as a single-pitch lead/toprope. The crux comes just 10-feet off the ground where you must pull a short but bouldery roof. The climbing remains sustained to the anchors. The second pitch has two starts: a direct 5.10c roof or 5.8 face moves around the bulge to the right and then back left into the main crack. The crack gradually widens and remains sustained to the Main Ledge. 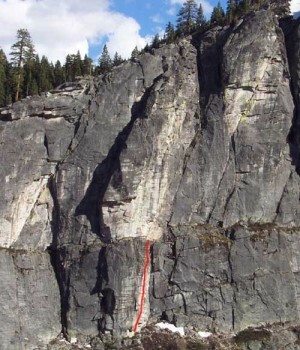 Either rappel to the ground or continue up Eagle Buttress, Right. Which SuperTopo guidebooks include a topo for Roofer Madness? The route as seen from Hogsback.